it’s Time to kick start my City career! AARON McEneff claims Derry City fans have yet to see the best of him and he’s looking forward to a fresh start as he attempts to put his stamp on the team this season. 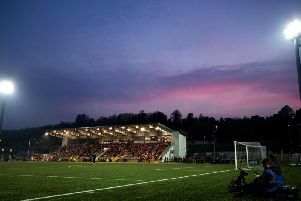 The 20 year-old Cornshell Fields lad returns to his old stomping ground at the Riverside Stadium tonight as Derry City begin their pre-season campaign with the annual Billy Kee Memorial Cup against Institute. The off-season gave me the chance to clear my head mentally and it’s a fresh start for me. I’ve come into pre-season a different player than the one who finished the season last year. McEneff, who joined the club from Tottenham Hotspur last July, felt he struggled to ‘find his feet’ in the League of Ireland as Derry City battled against the drop. However, after working hard in the off-season, he’s impressed the Derry City management with his fitness levels and is confident he can step up to the mark and become an integral part of Kenny Shiels’ team this year. “I came in midway into the season and I had just come back from England and was finding my feet,” explained McEneff. “I hadn’t played much football last season prior to that with injury. “The off-season gave me the chance to clear my head mentally and it’s a fresh start for me. I’ve come into pre-season a different player than the one who finished the season last year. So hopefully I can push on and show a bit more throughout the whole season. “I was in before pre-season for three days a week in Foyle Arena at the gym and that’s stood me in good stead for pre-season. I feel fit and strong. “We’ve been doing a lot of ball work as well which I like, mixed in with the gym sessions that Pearce (Lafferty) is taking so it’s been good. The management team have been great since they’ve come in and I get on really well with them so everything’s good so far. “You have to enjoy the off-season but I had more than half an eye on the season ahead and just wanted to come back in and be as fit as I could. So I’m in a good frame of mind starting pre-season and while I’m not 100 per cent ready for the season just yet, I’m getting there. We’ve a few matches coming up now and I’ll push on a bit more. McEneff is expected to play alongside Conor McCormack in centre midfield tonight at Drumahoe in a strong looking Derry City XI and despite supporters’ concerns about the lack of transfer activity at Brandywell lately, McEneff believes the current panel have plenty of technical ability to entertain the fans this season. “It’s a strong squad going out to ‘Stute and it’s our first pre-season game so I’m sure there will be a bit of rust but hopefully we can get it out of the way early doors and find our feet quickly. “It’s early stages, but everyone’s been positive and the vibe around the training ground is good. There might be a lack of experience but there’s a lot of young players who have good fitness and a lot of technically good players in the squad. “Kenny (Shiels) likes to play alot of football on the deck and it suits my game because I like to keep the ball on the floor. People might say Kenny hasn’t made too many signings but if you look at the back four, it’s more or less the same as last season. And big Nic (Vemmelund) has come in at right back and it’s a strong back five.